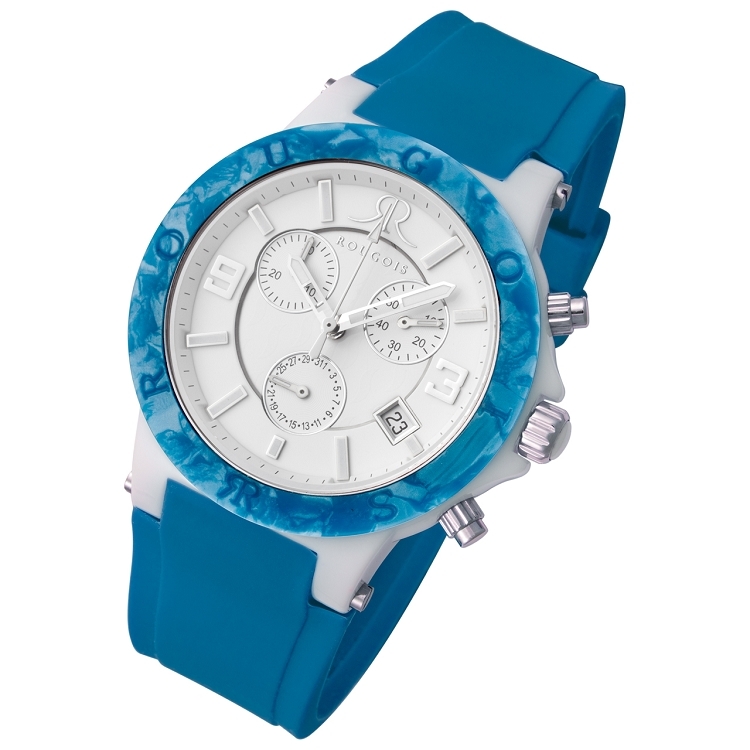 This is a Rougois Pop Series colorful watch. A unique combination of materials joining together to make this fine watch an instant sensation. Electronic quartz movement. Patented double rotor motor. Rotating stepping motors. Small second, 1 step per second. 6 Hands. Stem 3 positions. Date by hand. Date by window optional, quick date correction. Central chronograph trotteuse, five steps per second. Minute-counter, 30 minutes, 1 step per minute. Auto stop and reset after 2 hours of timing. End of life (EOL): Indication by small second hand jumping 4 successive steps every 4 seconds. Stop device and current breaker.